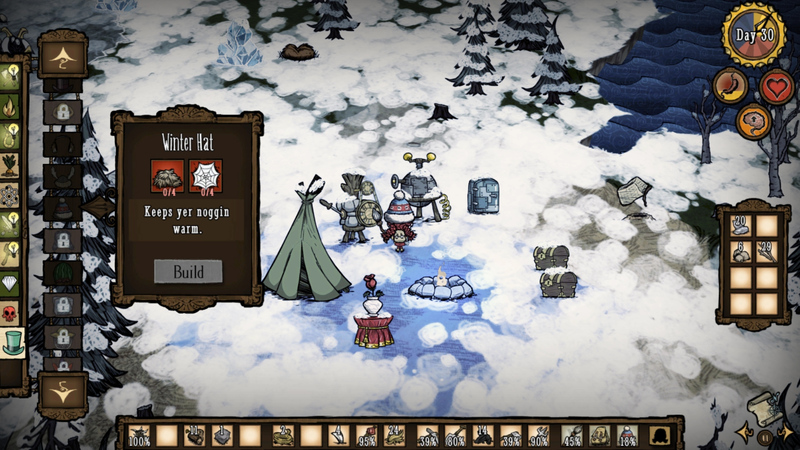 The most difficult task you’ll face in Don’t Starve Together is surviving the short frosty days and long freezing nights of winter. Whether you’re playing as Wilson, Willow, Wigfred or Woodie - you’ll find that the key to survival is making sure you're prepared. Use this simple guide to ensure you don't freeze (or starve) during the treacherous winter season. 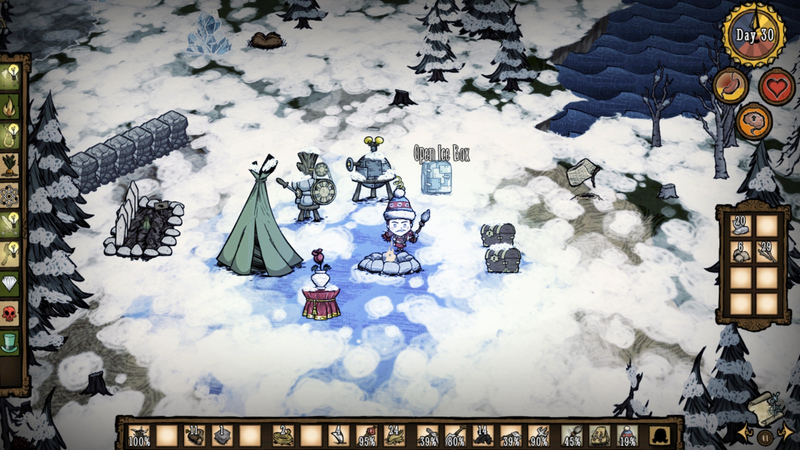 Upon first starting out in Don't Starve Together, the first thing you should note is that winter begins on Day 21. Wintertime lasts for 16 days, coming to its cold, bitter end on Day 36. Keep this in mind when gathering rations and stocking up on resources. Prepare for the long haul! The first order of business is finding a suitable spot to start building your settlement. There are key things to look out for when choosing your new “neighborhood”. The most important features being the amount of food and resources nearby. An abundance of trees, stone, flowers, berries, rabbits, and overall wildlife is crucial to your survival, regardless of the season. Find a spot close to a diverse range of biomes, particularly the forest, savanna and rockyland biomes. Once you've picked a place to settle, build a fire pit, some wooden chests, and a tent. The first two items are basic necessities for a new settlement, and since the winter has a way of driving characters to the brink of insanity, a tent will also serve as a very useful. Tents restore health and sanity while you're sleeping. But be wary of the impact it’ll have on your hunger. One of the essential items in your survival will be the Ice Box. This handy little item keeps your food cold and slows down its degradation process. You’ll find that farms don't produce in the winter, and items like berry bushes have a slower respawn time in the colder season. Because of this, it’s important to collect as much food as possible and store it in the Ice Box. Things like cooked meat, veggies, berries, and more will have a longer lifespan. Once your Ice Box is built, you’ll want to fill it up with some revitalizing food. Depending on your character, the kind of food you're looking for will vary. Since many characters thrive on meat, setting up traps is crucial. Find an area full of rabbit holes, lay a bunch of traps down, and bait them with carrots. You can also try building some bird traps near your settlement and baiting them with seeds. Doing this will supply you with enough tiny morsels to stock up your Ice Box. Take this one step further by building some drying racks. This will allow you to turn those tiny morsels into jerky, which replenishes hunger and improves your sanity (a rather hard thing to keep up during the long winter nights.) Other great sources of meat are Tallbirds and Beefalo. Tallbirds provide 2 steaks and an egg while Beefalo drop 4 steaks and some Beefalo fur. But approach these two animals with caution since they are very powerful foes. Pro-Tip: Make sure you're placing your food supply into your Ice Box as soon as possible. Also, try to store fresher food separately from older food and consume older food first. This will ensure that all of your food supply doesn't go stale. Now that we have the food situation covered, it's time to work on staying warm. Thermal Stones are easy to make, easy to use, and keep your character from freezing. All you have to do is charge it up next to the fire at night. Once it turns bright orange, it’s ready to use. As long as you have the stone in your inventory while you're off galavanting, you're sure not too freeze (until it loses charge then you must charge it up again.) With each use, the stone loses a percentage of its durability. It's wise to craft 3-5 of them and store the ones that aren't in use until you need them. 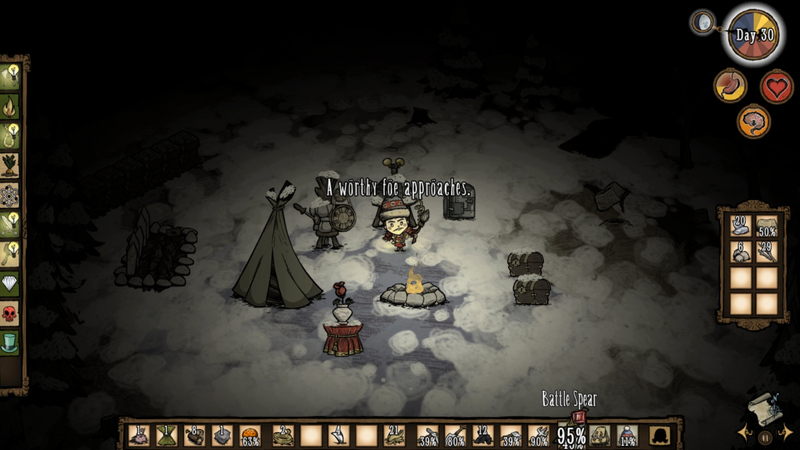 Another failsafe to surviving the winter in Don’t Starve Together is crafting a trusty Winter Hat. Of all the craftable winter attire in the game, the Winter Hat requires the easiest and least amount of resources to find. This means you can craft a few before the cold season strikes, and have one at the ready, at all times. To preserve your winter attire, unequip it during your time near the fire since it won't supply you with any additional warmth during this time. Once you’ve secured your food rations and prepared for the drop in temperature, you’ll now be tasked with stocking up on resources. These include things like wood, sticks, stone, gold, flint, grass, and even manure. This will provide you with a good foundation, enabling you to craft weapons, build impromptu fires, torches and more. This is vital since the winter slows the growth of tree saplings and grass tufts. Another thing to note is that days are shorter during the winter, so traveling far from your settlement in search of resources may be unwise. 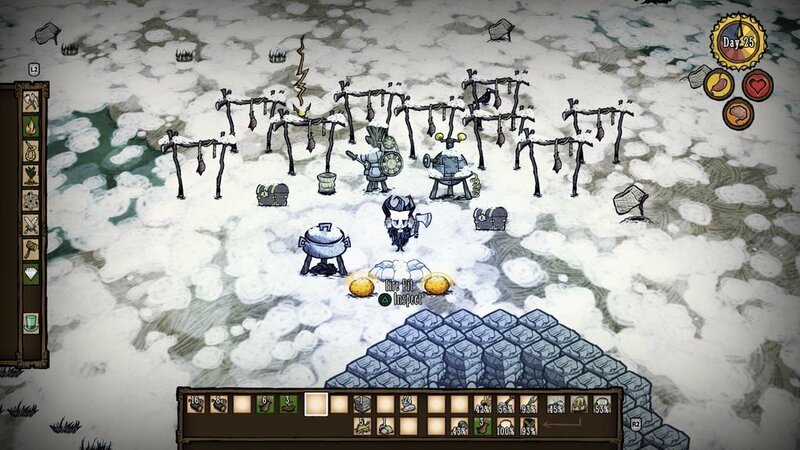 When winter arrives in Don't Starve Together, you'll notice a change in the way things look. Trees will lose their leaves, ponds will freeze over, rabbits will sport a white fur coat, Snowbirds and Pengulls will appear, and red hounds turn blue. With that change of scenery comes a set of new threats. While hounds will continue to show up unannounced, beware of the Deerclops, a giant snow monster notorious for wreaking havoc on everything in its path. Also, keep an eye out for a group of wiley walruses. No longer will you mutter the dreadful words, “Winter is coming!” With the help of this guide, we can assure you that you’ll be more than ready for every obstacle Don't Starve Together will throw your way. For more Don't Starve on Indie Obscura, try your hand at our basic tips for survival, check out the two new indie games Klei unveiled and use this guide if you're struggling with your first night in Don't Starve Together.